I wait for Viburnum plicatum ‘Mary Milton’ to bloom the way other people anticipate their first slobbery bite of a field-grown summer tomato. Memories of ‘Mary Milton’ dribble through my consciousness during winter, making the dormant season bearable. Although you’d think that I would want to distance myself from visions of snowballs by spring, still, that chilly analogy always comes to mind while I’m waiting for my ‘Mary Milton’ to gear up in April. And when the first green buds start to swell and blush, I wallow in the prolonged prospect of weeks upon weeks of suspended drama. I’m not prone to cartwheels and any tap dancing that I do is generally confined behind closed doors. But when ‘Mary Milton’ is happening, my inner glee meter spikes right off the charts. My first ‘Mary Milton’ was a blind date. Whatever Carol Yee of Carol’s Collectibles (www.carolscollectibles.com) suggests, I obediently try — she definitely knows her stuff. So when she put a puny little unnamed viburnum in my hands at the first Trade Secrets (www.tradesecretsct.com), I opened my wallet without hesitation. She promised that I’d love it, and I never doubted. Years went by. I had stashed it on the sidelines of the property while it remained in the ugly duckling incarnation. But ugly duckling was beginning to look fairly permanent. So I made the “all or nothing” leap and moved it to my perennial border’s most prominent position (as a testimony to my faith in Carol Yee). Smack dab right in the view line of my office window, it was either perform or perish. That’s when ‘Mary Milton’ danced into her swan stage. She never looked back. Watching this shrub wind up into flower is bliss. Even before ‘Mary Milton’ began its role as a flowering shrub on my property, I valued it for its accordion pleated foliage that unfolds in a bronze shade and later turns green. It is easily the loveliest viburnum leaf. 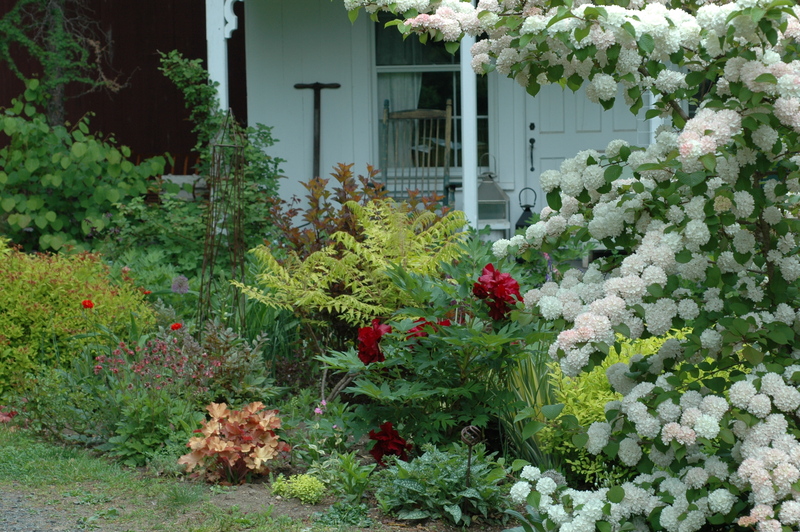 Then come the apple green buds followed by those blush pink snowballs that smother the entire shrub. After a couple of weeks, the blossoms begin to bleach white in a slow and delightful dance. They hold in that state for weeks before browning. It should be said that they don’t self-clean, but nobody’s perfect. And a vigorous shake usually sends the entire inventory of brown snowballs floating onto the ground. ‘Mary Milton’ needs a stern pruning on a regular basis, preferably early in its career. I woke up one spring and found that the shrub had gone awkward while I was busy letting it do “it’s thing.” Cars were stopping to take pictures. Neighbors were offering me cheesecakes to reveal the shrub’s name. I was feeling mighty popular. But when a neighbor stopped by to offer pruning help (why me? ), I stood back with a critical eye (rather than a mother’s unreserved love) and realized that ‘Mary Milton’ had gone over the edge. She had seriously outscaled her bedfellows and was stealing the scene (actually — thank God for neighbors). That’s when ‘Mary Milton’ got a good, stiff, remedial shearing. 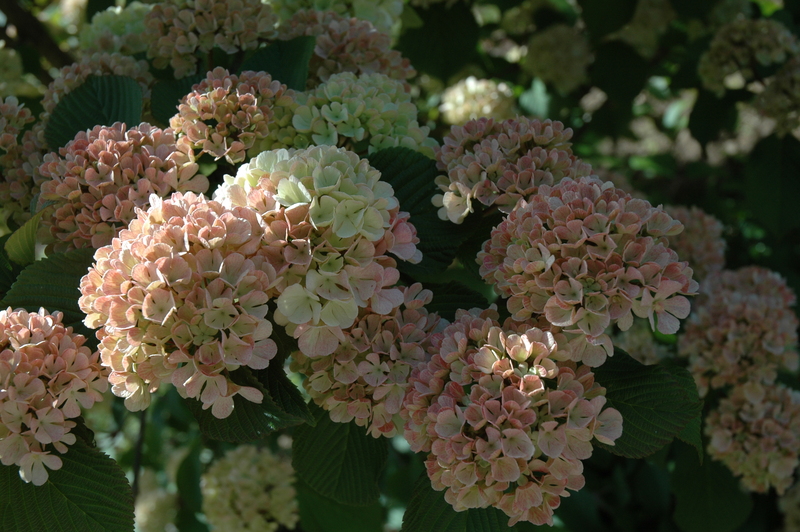 Part of the beauty of Viburnum plicatum cultivars is that they are not pestered by deer. I read that they are poisonous to humans as well, but can’t seem to find more specific information. Meanwhile, I’ve been propagating the shrub by encouraging the lower branches to “heel” into the ground and send down roots. To tell the truth, increasing the family hasn’t entirely been my own idea. There’s a waiting list. Come to think of it, you don’t suppose that the pruning volunteer had an ulterior motive, do you? 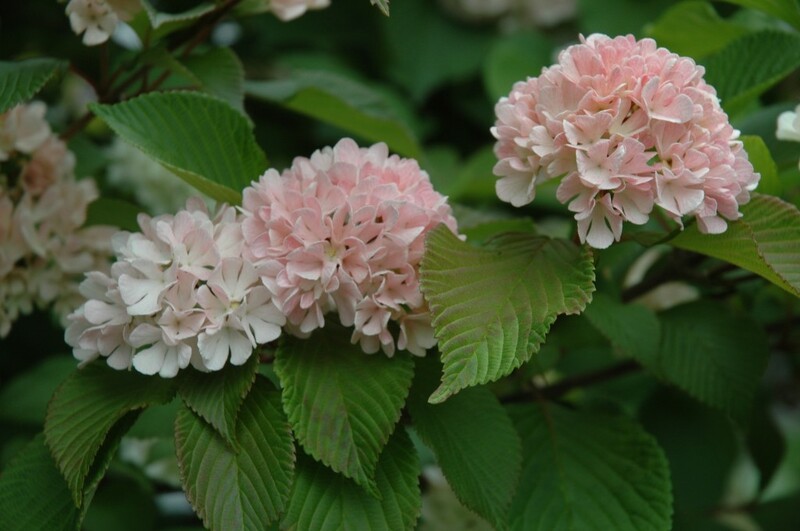 An excellent source for Viburnum plicatum ‘Mary Milton’ is Broken Arrow Nursery (http.//www.brokenarrownursery.com). Wow, just…Wow. What a display! This is one I’ve never seen before but just have to seek out. Thanks for providing the source link. You know, I had this shrub for years before it was in the trade and I found a name for it, Prof. It’s one of my proudest possessions in the world. Plus it stands up to whatever life hands out. Broken Arrow just started doing mailorder and you can get it in a small size. I had a little trouble with a young, newly planted ‘Mary Milton’ in last year’s drought, but I’m pretty sure it survived. I attended an Audubon sponsored lecture last night about landscaping for birds and other wildlife and the speaker answered someone’s request asking for plant suggestions with this: “Oh, I can recommend dozens of plants that are great for the birds and other wildlife. They are viburnum, viburnum, viburnum, etc.” You get the idea. Thanks for letting us in on ‘Mary Milton’~ with some pruning, I could keep her to a size appropriate for my small backyard garden. Love the pink blush color! Lisa, you’re like a hotline — you really do get around. I’m always watching birds land on ‘Mary Milton’, but that said, I haven’t seen any berries on this particular viburnum. But as we all know, berries aren’t the only bag of tricks for birds. Thanks Tovah! 🙂 Thursday my garden club is hosting David Culp, the hellebore and snowdrop specialist. We toured his garden a few years back and this time, he’s coming to speak to us. This will make up for me missing the Phila Flower Show this year due to bad weather! Your ‘Mary Milton’ almost looks like a hydrangea of sorts- it’s really lovely. I’ve sent for a catalog from Broken Arrow Nursery and look forward to seeing more of their offerings. Lucky you! David Culp is an encyclopedic resource — I knew he was big into hellebores, but didn’t know he extended to snowdrops as well. Does he sell? 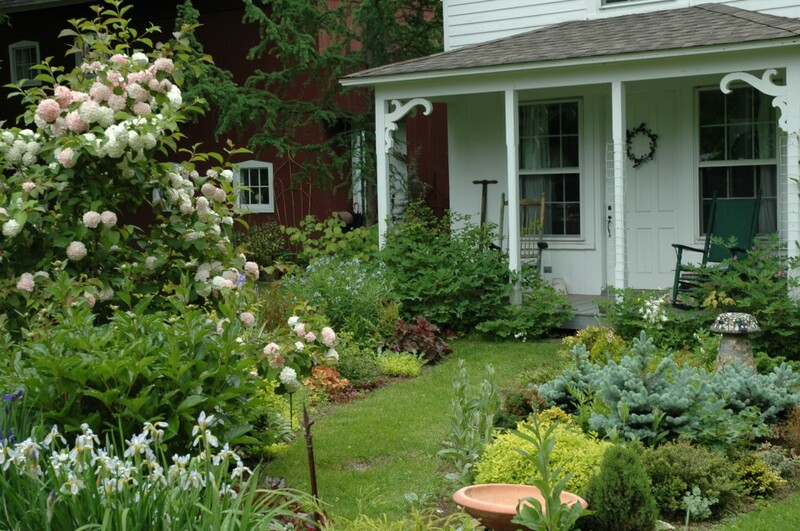 Do you know Hitch Lyman’s collection — The Temple Nursery in Ithaca, NY? I’ve ordered from him (my favorite is the double ‘Cordelia’). Do you happen to know how Jerry Fritz from Linden Hill did with his snowdrop experiment for the Philly Show? You’re going to love Broken Arrow Nursery. A friend called them “the prime plant hounds in the country” and he wasn’t just whistling Dixie. If something is wonderful = they have it. Jerry was dabbling in forcing snowdrops with the specific dates of the Philadelphia Flower Show in mind, Lisa. If not Mission Impossible, then definitely Mission Implausible. Forcing snowdrops is tricky; holding them to a schedule is like herding cats. Please report back to us re: David Culp’s book — we’re in complete anticipation mode. Tovah, I was wrong. David Culp does sell his Hellebores. His website is http://www.davidlculp.com. Don’t know if he sells anything else though. Great website — and who isn’t thinking hellebores right now? Did you get any snow? I love this Tovah. How sweet is it. Would it be happy in the colder climes of NH? I may have to have one of these! You know, even I fell into a swoon when I put that picture up, Maude — one forgets how ravishing these plants are when the growing season is just a memory. And imagine hundreds (maybe thousands, but who’s counting?) of those blushing blossoms. I’m still a little befuddled about how to shape it. Viburnums don’t lend themselves to discipline, do they? I think it would work in NH. Zone 5 like all the other Viburnum plicatums. Certainly doesn’t rush into flower in spring, so there’s no danger of bud damage in a late frost. Usually starts blooming the second or third week in May. It’s worth swooning over. And I wouldn’t be too concerned about pruning it. I rather like that rambling look yours has. As if she is a grand dame dancing through your garden, swishing about, adorned in sweet blossoms, making all the other plants envious. Well, she thinks she’s Queen, for sure. But I’ve got to tell you = there’s a Corylus ‘Red Majestic’ and a Tiger Eyes sumac that are doing their best to catch up with her. Pretty soon, she’s going to have some serious competition sizewise. But when she’s in bloom, it’s no contest. Okay Everyone. You heard it first here = News Flash! David Culp is writing a book on PLANTS! Land o’ Mercy, who would’ve thought? That’s it, my new resolution for 2011 is to hear David speak. Lucky you that you’re in his ‘hood. Thank you so much, Lisa, for giving us the vicarious experience. Sorry, I’m wrong. It’s http://www.gardendesign.com. Tovah~ Now all I need to do to complete my horticultural speaking events wishlist is to come and listen to you talk about Terrariums at Linden Hill Gardens in October! We bought what we thought were MM Viburnums last year. But this Spring the blooms were pure white. Is this a case of nursery mis-labeling or does the pinkish color come later? Actually, ‘Mary Milton’ opens with a deep blush pink and fades to almost white after a couple of weeks in blossom. The buds are chartreuse and the flowers look like dome-shaped snowballs before the begin to brown after 3 weeks or so in blossom (depending on the weather). So, if she didn’t open salmon-ish pink, I would suspect that there’s an identity crisis. I cannot believe that little wisp you gave us last year produced at least a dozen blooms this year! I was so excited when you gave it to us, but expected several years before it would unfold its beauty. Will have to let Maude know that she is a spectacular performer here in the Monadnock region.